Avg. weight* 8lb. 6oz. 8lb. 5oz. Forcing Cones 5" Long "DuoCon" 5" Long "DuoCon"
*Weights may vary based on wood density. **Measured from the lowest point of the barrel. Drop at Monte Carlo 1.75"
*With comb in lowest position. **Measured from the center of trigger adjustment in rear position. 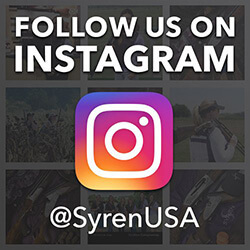 The Syren Tempio Trap is the first and only gun specifically tailored for female trap shooters. This no compromises competition shotgun puts a premium on performance as well as aesthetics. First and foremost, the shotgun needs to fit and handle properly. To accomplish this, Syren has created a stock that is designed to fit the female shooter. Some of the specialized dimensions include; length of pull, a smaller grip, and an increased pitch and cast to name just a few. The barrel and stock weight are calibrated to make the gun balance properly and easier to handle. To further customize the firearm we have incorporated the DTS (Dynamic Tuning System), which allows any shooter to tailor the gun to their individual style. The rib on both the over-and-under and unsingle barrel are adjustable for point-of-impact. The second aspect is the DTS comb, which moves four ways allowing the shooter to adjust the comb height, drop, offset, and cast. At the heart of the DTS system is the trigger, which is designed to meet the most demanding expectations with adjustable take-up, over-travel, and length of pull. Another key feature is the Syren Tempio Trap guns durability, which is designed to meet the high volume demands of thousands of rounds a year. As if that wasn’t enough, the Syren Tempio Trap is backed by an industry leading limited Lifetime Warranty and Service that is second to none. Cosmetically the goal was to make a firearm that was both traditional and elegant, but distinctive in a way that separates it from the male-oriented products. The action features a classic scroll and bouquet engraving pattern highlighted by gold accents. The wood is a deluxe grade of Turkish Walnut that has been hand polished with an oil finish. The result is a shotgun that is as beautiful as it is functional.